Peace activist Melvin Giles was raised in the Rondo neighborhood, next to the site of the garden he founded and called the Aurora Peace Sanctuary Garden. The son of a gardener and grandson of sharecroppers from Mississippi and Alabama, he has always had a passion for growing food. He partnered with students from Gordon Parks High School as well as his brother, Metric, and artist Seitu Jones to establish the Peace Sanctuary Garden in 2004. Melvin wanted the garden to inspire people to think about how they could bring more peace to the community. “Community gardening is an organizing tool to start conversations with neighbors about restorative justice,” he says. As an experienced diversity educator, Melvin promotes Peace Pole awareness in hopes of decreasing violent crime and creating spaces for racial and cultural appreciation. Melvin’s brother used to live in a house on the lot that now hosts the Peace Garden. 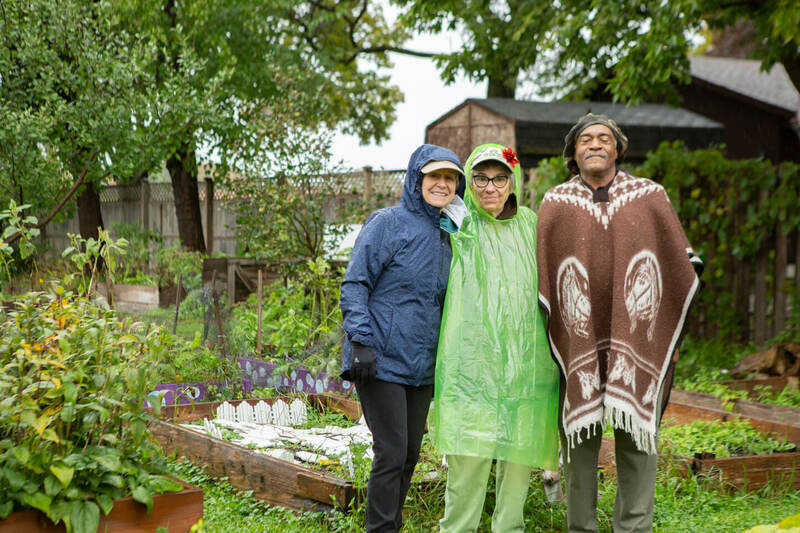 After a fire, the lot was divided and repurposed, evolving into a garden that complements Melvin’s activist work. Today, Melvin calls the Peace Sanctuary Garden an environmental learning center. The narrow lot hosts events throughout the growing season, including a weekly Children’s Gardening program that’s open to any and everyone. At least 50 adults and 50 kids gardened here over the course of the summer, learning about watersheds, healthy eating, and composting.